USDCAD is under the influence of Canada’s unemployment rate and Canada’s housing starts data for June along with some economic reports in the US as such as 10-y Bond Auction, Wholesale Inventories m/m, JOLTS Job Openings, and NFIB Small Business Index. Today USDCAD had a sharp decline towards the support area falling down the descendant Andrew’s pitchfork. 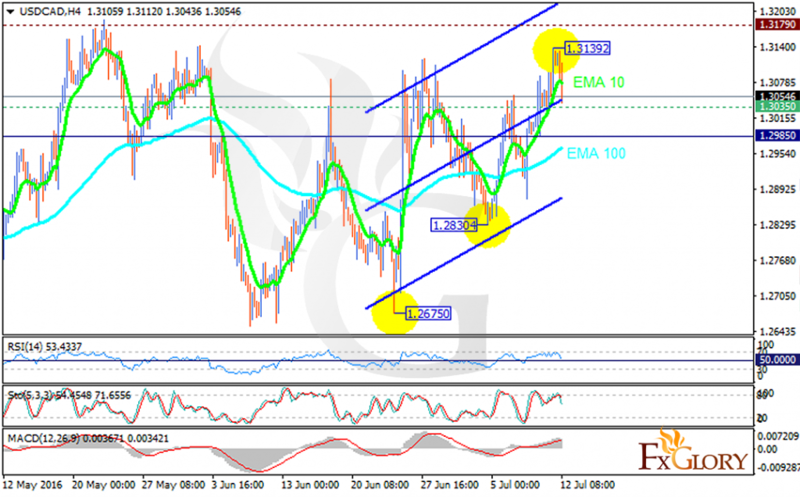 The support rests at 1.30350 with resistance at 1.31790 which both lines are above the weekly pivot point at 1.29850. The EMA of 10 is located above the EMA of 100 and they are both climbing up the ascendant channel. The RSI has reached the 50 level after its decline from the overbought area, the MACD indicator is in positive territory but the Stochastic is showing downward momentum. There would be a strong support around the 1.29 area therefore the pair may fall to this level but it is not going to fall further.